When we first moved to Missouri from Southern California, we didn't have much in the way of winter wear. Miss M was only two when winter arrived and hadn't quite mastered the skill of napping without assistance, by which I mean she needed to be cuddled to sleep. I spent a lot of time sitting with her asleep on my lap. I kept my hands busy by knitting or crocheting warm things for us to wear. 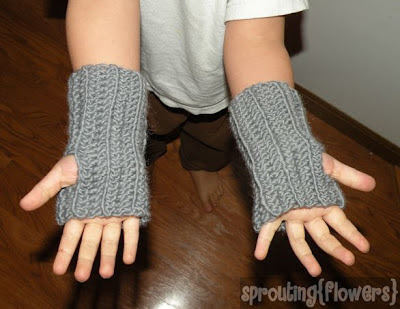 One pattern I made was Suzetta's Fingerless Mitts. I made some for each of us! It's been four years since then and one of Miss M's mitts was lost, and she has taken to wearing the pair I made for myself. Little Guy wanted a pair to wear too! So I promised to make him a pair. I chose a nice soft 100% wool yarn by Brown Sheep and whipped up a pair of fingerless mitts in one sitting. Wool is fantastic for keeping little boys warm, because little boys like to be independent and do things like wash their hands and clean up spills all by themselves. Their independence often leads to wet sleeves! But wool keeps in heat even when it gets wet, unlike other materials. 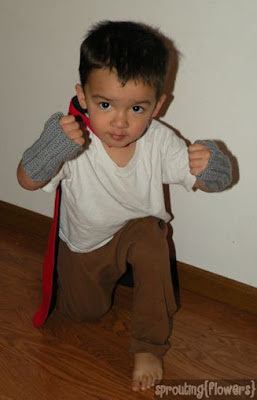 Fingerless mitts bestow super powers, didn't you know? He's been wearing them constantly! If only everything I made was received with such enthusiasm!